England's Jos Buttler hits out during the Vitality International Twenty20 match at Edgbaston last month. Now he and England turn their attentions to a five-match Test series with India that will start at Edgbaston on Wednesday (Picture: Mike Egeton/PA Wire). Jos Buttler has set his heart against India this summer on a so far elusive goal – his maiden Test century. It is exactly four years ago that Buttler hit what is still his highest Test score, against these same opponents on their last tour, at his first attempt. In 32 subsequent innings, spread over 20 matches, he has not bettered the 85 he made on debut in the 266-run victory at Southampton. Back then, he was keeping wicket too in Tests as well as the limited-overs formats, but has returned this summer – at the behest of new national selector Ed Smith and on the back of his brilliant Indian Premiere League form – as a specialist batsman, with Jonny Bairstow instead behind the stumps. It has been a happy return so far, Buttler marking his first Tests since Chennai in December 2016 with back-to-back half-centuries in the drawn series against Pakistan. Still, three figures evade him and down at No 7, even with his remarkable shot-making ability, it will be no easy task to chalk off century No 1. If he does so, he is in no doubt that in the five-match Specsavers Test series against India it will be coming on one of the biggest stages of all – comparable, he believes, to the Ashes. “Absolutely, it is a huge series,” he added. “India are a fantastic team – in all conditions as well now. Buttler anticipates too that the high stakes will ensure IPL friendships are tested occasionally, despite India captain Virat Kohli’s observation that opposition players are more in tune with one another these days thanks to time spent together in the lucrative annual franchise tournament. “I am sure there will be moments in the Test series, especially on the field, when those things look like they have been forgotten,” said Buttler. “It will be highly competitive. He has great respect for Kohli, however, and especially the trained ability he shares with other superstar players to almost always play the right shot at the right time. “They seem to make the right decision a lot of the time – that is a skill,” he commented. England will be looking to their own, such as all-time national record runscorer Alastair Cook, to measure up and Buttler has great faith in Joe Root’s team to each do their own homework and rise to the challenge set by India’s spinners. Kuldeep Yadav may well be lurking among them, having been chosen in India’s Test squad after proving so effective against England in the preceding white-ball encounters. Buttler said: “Alastair Cook has a fantastic record against spin bowling. “There will be pointers other guys can share, about (Kuldeep’s) angle of attack and pace he bowls. But until you go out in the middle and do it yourself there is only so much that stuff helps. Meanwhile, Stuart Broad accepts he is far from certain to play all five Tests against India as England make contingencies for an exacting schedule over the next six weeks. The Specsavers series may contain up to 25 days of gruelling action, with the pace bowlers most likely to feel the heat, especially if temperatures continue to soar in what has already been one of England’s driest summers on record. Broad and all-time national leading wicket-taker James Anderson both proved their return to fitness by coming through last week’s round of county championship matches. But he has revealed pre-series discussions with management that have covered the possibility of rotating the pace personnel. As he prepares for his 119th Test, and England’s 1,000th, at Edgbaston on Wednesday, Broad spelled out he will take it on the chin if prescribed rest at some point. Broad was troubled by a recurrence of pain in his ankle before his return for Nottinghamshire and veteran Anderson took time out to rest his sore right shoulder. As for any seamers needing another brief break, Broad added: “I think we will have to play that by ear – it will depend on tosses, pitches, workloads. “If (there are) two Tests of 250 overs in the field each, it’s unrealistic to think your seam bowlers will play five Tests in six weeks. 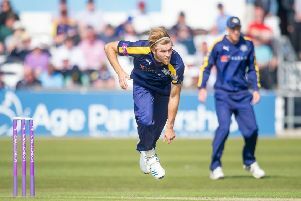 He was reassured when he came through 19 overs with no ill-effects in an innings defeat at home to table-toppers Surrey. Broad cannot be so certain, though, about England having conditions to their liking as the heatwave promises a home from home for India instead.